Trigger finger and thumb are painful conditions that cause the fingers or thumb to catch or lock in a bent position. The problems often stem from inflammation of tendons that are located within a protective covering called the tendon sheath. 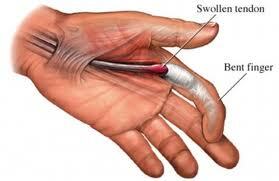 The affected tendons are tough, fibrous bands of tissue that connect the muscles of the forearm to your finger and thumb bones. Together, the tendons and muscles allow you to bend and extend your fingers and thumb, for example, as in making a fist. What are symptoms of trigger finger? Symptoms of trigger finger develop when either the ring, middle, or index finger attempts to flex closed while gripping. Instead of a smooth, continual closure, the digit stutters, then snaps closed. The closure is frequently associated with pain at the base of the digit on the palm of the hand. Trigger finger can affect the thumb. Trigger finger is caused by local swelling from inflammation or scarring around the tendons that normally pull the affected digit inward toward the palm (flexion). Usually trigger finger occurs as an isolated condition. Sometimes trigger finger is an associated condition resulting from an underlying illness that causes inflammation of tissues of the hand, such as rheumatoid arthritis. In fact, data presented at the 2005 American College of Rheumatology national meeting suggests that a majority of patients with rheumatoid arthritis have inflammation around the tendons of the palm of the hand that could develop into trigger finger. The first step to recovery is to limit activities that aggravate trigger finger. Occasionally, your doctor may put a splint on the affected hand to restrict the joint movement. If symptoms continue, anti-inflammatory medications. Your doctor may also recommend an injection of a steroid medication into the tendon sheath. If the condition does not respond to conservative measures or consistently recurs, surgery may be recommended to release the tendon sheath and restore movement.